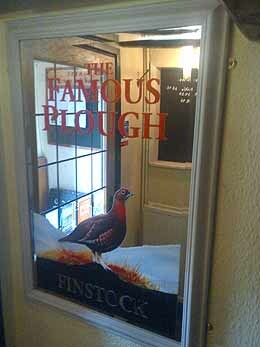 we have been asked to print all sorts of designs to many different materials, however recently we were asked to print a full colour image on to a mirror! So since this was such a success we have been offering this service to other people. But not only mirrors, onto glass as well. The process to put ink onto glass or a mirror to give good vibrant colours is a fairly clever one. If we are to print to a clear material like glass or acrylic then we can print onto the back of the material so that when the picture is displayed, it is on the back of the media, so safe from being scratched off. However with mirrors, we have to print directly to the front of the glass, and so to get good colours, a white primer has to be printed first so the rest of the colours come out as they are supposed to.